As you may have read by now, Senator Max Baucus (D-MT), Chairman of the Senate Finance Committee, has announced that he will not seek re-election in November of 2014. Washington is abuzz with speculation about the implications for policy (tax and health reform) and politics (Democratic control of the Senate, the identity of the next Finance Committee Chairman). The most off-base chatter is the suggestion that a retiring Chairman Baucus will pursue different policy than would a campaigning Chairman Baucus. Such talk is a branch office of the chatter in late 2008, late 2010 and late 2012 that a monumental budget deal would emerge from those “lame-duck” sessions of Congress. The thinking (to be kind) was that departing Members of Congress, at last freed from the tyranny of their constituents, finally could vote their true convictions and would turn a policy 180 to make the tough choices. What we learned, instead, was that those free-at-last Members of Congress actually had been voting their convictions all along, and had no reason or inclination to change their stripes in the dying days of their final Congresses. Chairman Baucus fits that mold. What he has done has been to represent his constituents, as he understood their views to be. (One can of course argue the dichotomy between representing, on the one hand, and educating and leading, on the other hand.) It turns out that Montana is different from what many metro-centric pundits live and breathe. I would like to think that economics and policy science are geography-neutral, but I fear that they really are geography-ignorant. My eyes were opened by a private conversation with a Washington reporter newly transplanted from upstate, rural New York, who related that the really good jobs in her home town were carrying the mail – because they provided the employee benefits (especially good health insurance) that we in Washington consider to be a prerequisite of even a near-poverty standard of living, plus a pay scale that is set nationally and approximates more closely compensation in urban areas. So people in Montana do not see the issues of the day in precisely the same light that we “dazzling urbanites” do. Chairman Baucus has reflected the perspective of Montanans in Washington. He likely will continue to do so until he heads back home. There is plenty of speculation over whether the Senate majority will see major action on tax reform (and health reform, also primarily under the jurisdiction of the Finance Committee) as helpful or harmful to their 2014 electoral prospects. Politicos further wonder how Senator Ron Wyden, who in 2015 will be the senior Democrat on Finance (Senator Jay Rockefeller (D-WV), now senior to Senator Wyden, has announced that he also will retire next year), will weigh his probable hopes to become Chairman (if the Democrats maintain their majority) against his willingness to take risks. Recall that Senator Wyden has designed adventurous reform packages in collaboration with Republicans (former Senator Judd Gregg (R-NH) on taxes, former Senator Bob Bennett (R-UT) and current House Budget Committee Chairman Paul Ryan (R-WI) on health care). He will need to consider how any positions that he takes in these two years will affect his standing with the Democratic Senate leadership. But all of that amounts to a matrix of suppositions at this point. About the only thing that we do know is that Chairman Baucus will have more time on his hands, given that he is not running for re-election. Frequent trips back home would eat up a lot of his time, given that he has among the worst commutes of all Members of Congress (even worse than mine, by at least a little). His retirement decisions will free him from some of that. Still, all of this is mostly window dressing. Chairman Baucus has an important position, but to accomplish anything he must have the support of a majority in the Finance Committee, plus the cooperation of the Senate Democratic leadership to get any bill to the floor. And then, under the most likely scenarios, he will need 60 votes on the floor (although it is conceivable that he could have a reconciliation instruction from a budget resolution, which could allow passage with 50 votes plus the Vice President), plus a majority in the House. And that final product must be acceptable to the President, as well. The fundamentals are daunting, and whether Chairman Baucus’s retirement will facilitate or prevent major budget action is anyone’s guess. Every now and then in economics, as I suspect in many other fields, some piece of supposedly settled wisdom is thrown into question by a revelation of human error. Such was the case in recent days with respect to a book and several papers by Carmen M. Reinhart and Kenneth S. Rogoff. Reinhart and Rogoff’s research, initially published just before the financial crisis but reprised over several years (and henceforth referenced in the common academic style as “RR”), has been widely cited to make the case that excesses of public debt lead to reduced economic growth. This finding, in turn, undergirds arguments in Europe and the United States for government budget retrenchment. But earlier this month, three faculty members of the University of Massachusetts-Amherst (Thomas Herndon, Michael Ash and Robert Pollin, hereinafter stuck with the moniker of “HAP”), working in part with a data spreadsheet provided to them by Reinhart and Rogoff, discovered errors in the original calculations. Given the prominence of Reinhart and Rogoff personally and of their findings in the budget debate, what should we conclude? How, if at all, should our thinking change? Just about every tennis player of a certain age – and every serious tennis buff – knows of Ken Rosewall. Despite losing some of his best years to a period when professionals were barred from the major tournaments, Rosewall, an Australian born in 1934, compiled an incredible record. He won eight “grand slam” singles tournaments, and in his prime and on his day was widely considered almost impossible to beat. In contrast, only the true tennis buff – of a certain age – has heard of Ray Ruffels. 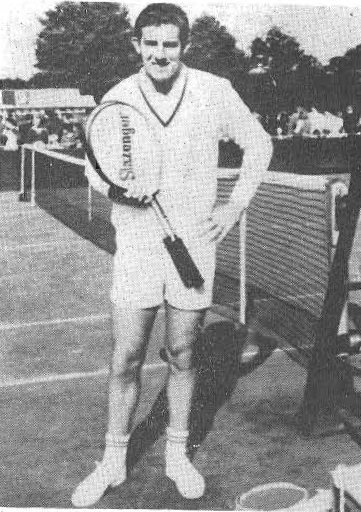 Ruffels, another Australian, born in 1946, evolved into a doubles specialist, notably mixed doubles. In 1978, when Billie Jean King had just about reached the zenith of her remarkable career and sought a 20th Wimbledon championship to surpass the lifetime record of 19 long held by Elizabeth Ryan, she chose Ray Ruffels as her mixed-doubles partner to do it. Ironically in the nascent Australian tennis madness of the late 1950s and early 1960s, there were few quality public courts. Serious players had to build their own behind their homes. Rosewall and Ruffels were good friends, and often would visit each other’s homes to practice and play. The story goes that in these private matches, Ken Rosewall never beat Ray Ruffels. But in major tournament play, and despite being 12 years younger, Ray Ruffels very rarely beat Ken Rosewall. Somehow, when the cameras were focused and the money was on the table, Ken Rosewall always could find the steel in his spine to withstand the pressure. Ray Ruffels couldn’t. Graceful transition to tax policy: As they declared in their April 8 opinion column in the Wall Street Journal, House Ways & Means Committee Chairman Dave Camp (R-MI) and Senate Finance Committee Chairman Max Baucus (D-MT) have begun to collaborate on a tax reform bill. As required by the Constitution, this bill, if it in fact proceeds into the legislative process, must originate in the House. And therein lies a cautionary tale. President Obama submitted his fiscal year 2014 budget on April 10. Some have criticized the President on the ground that the budget was more than two months late. (The statutory deadline is the first Monday in February.) That criticism is fair enough – with the footnote that budget decisions for the preceding, ongoing fiscal year were well behind schedule as well, and in fact were not completed at the turn of the calendar year, when the ink of a President’s budget always has been both figuratively and literally drying. The budget law was written under the presumption that a President would know the budget outcomes for one fiscal year before he was required to prepare and submit the budget for the next. There was a throwaway comment in the early press that “the President’s budget has virtually no chance of being adopted.” Well, no President’s budget ever is adopted; the Congress always makes changes (if it adopts meaningful budget legislation at all). A much more important test today is whether the President’s budget moves the current fiscal stalemate off of dead center (with the accent on the “dead”). We will have a deeper account of the prospects for the politics and policymaking of the budget season next week. But the big-picture takeaway from the release of the budget is that this is the biggest and best opportunity to move the ball that anyone in Washington could have had a right to expect. It’s time, guys. As you may know, an early but active debate on tax reform is underway. My 1987 article, HOW TAX REFORM CAME ABOUT, provides a useful perspective from the time of the last successful attempt at tax reform. The situation in 1986 was different from today in many important respects – in particular, the overall budget situation was bad, but better than it is now. Still, the “1986 model” remains relevant, because many key tradeoffs – between total revenues and tax rates, among groups that enjoy tax preferences, among income groups – are inherent in any quantum change in tax policy. Perhaps most important is the political dynamic. Tax reform in 1986 required the cooperation of the Congress with a President whose party controlled the Senate, but did not control the House. Still, leaders of the two parties communicated with each other, and found common ground. Policymakers came to realize that the serious faults in the then-current system gave them the potential to achieve important steps forward for many taxpayers and for the economy. And as policymakers studied the issues, they learned that there were important advantages to a tax system with a broader, more-neutral base and lower tax rates. The article is made available with the permission of Tax Notes, which is the original publisher.